A plan to make Number 6 believe he is someone else is put into motion. This episode would seem to take place before "The General" since Number 6 aprently does not know the General's identity when Number 2 mentions it near the end of the episode. The title "The Schizoid Man" is a reference to schizoid personality disorder, a personality disorder which evidences secretiveness, emotional distance, lack of sociability, and tendency towards solitude. The woman with telepathic abilities in this episode is Number 24. A different Number 24 appeared in "Dance of the Dead". The cards used by Number 6 to test Number 24's telepathic abilities are known as Zener cards after their designer, perceptual psychologist Karl Zener (1903–1964), who worked with parapsychologist J. B. Rhine (1895–1980) testing subjects for extrasensory perception in the 1930s. 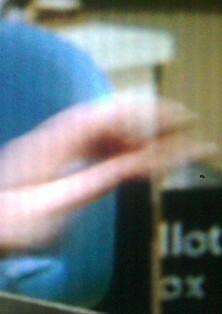 At 4:20 on the DVD, a spritzer bottle on the countertop has the Village's penny-farthing symbol on it. The camera used by Number 24 appears to be one of the 100 Series folding cameras produced in Polaroid's Land Camera line from 1963-1966. The photograph of Number 6 taken by Number 24 has a daily calendar in the background with the date of February 10. And the smaller daily calendar next to Number 6's bed at 7:30 on the DVD shows Wednesday, February 10. The closest February 10 to the production to fall on a Wednesday was in 1965. Is that the year the series is meant to take place? It was shot in 1966-67. The next closest year would have been in the future, 1971. Then again, in "The Chimes of Big Ben" Number 6 retorts to Number 2's confession that he'd like to see the whole Earth as the Village, “I'd like to be the first man on the Moon!” and the event of the first man on the Moon passed in 1969, so that would rule out 1971 except that the producers had no sure way of knowing that would happen at the time. And, of course, who's to say the dates kept within the Village are accurate at all? The man working with Number 2 in the Control Room is Number 118. A different 118 was a taxi driver in "Arrival". At 6:05 on the DVD, Number 2 asks the controllers to patch the main screen into Number 6's room with infrared. Infrared is a portion of the electromagnetic spectrum invisible to the human eye, but can be used by human-devised instruments to see in the dark. However, it provides only a two-color image (such as black-and-white or green-and-white), not the color image seen here. The technician who preps the sleeping Number 6 at 6:50 on the DVD is Number 100. A different Number 100 is in charge of prepping Plan Division Q in "It's Your Funeral". The date on the medical clipboard on Number 6's bed at 7:51 on the DVD is February 11. In this episode, the powers-that-be try to get Number 6 to believe he is actually Number 12, while a look-alike is the true Number 6. In "Free for All", a number of different Village inhabitants can be seen wearing the Number 12 badge on close inspection. Was this just sloppy prop handling in "Free for All" or is it all meant to suggest that Number 12 is a significant identity used by the powers-that-be? Number 6 also colludes with a different Number 12 in an attempt to escape the Village in "The General". Notice there is a suitcase in "Number 12's" closet at 9:25 on the DVD. Possibly it's there to give Number 6 the impression that, as "Number 12", he will be allowed to pack up and leave the Village after his mission there is complete. (In fact, Number 6 does pack and take the suitcase under the guise of Number 12 in his escape attempt at the end of the episode.) Do the general inhabitants of the Village also have a suitcase in their closet? It seems unlikely they are ever allowed to travel somewhere else, but maybe they would be given a suitcase to suggest it may be possible to leave at some point in the future if they are cooperative during their confinement in the Village. The old man being pushed in the wheelchair at 10:12 on the DVD appears to be Number 243. The woman pushing him appears to be Number 38; in "The Chimes of Big Ben", Number 38 was a different, elderly woman. Two different Number 243s appears in "The General" and "Hammer Into Anvil". When Number 2 meets with "Number 12" for breakfast in his office, he offers breakfast items either à la carte or table d'hôte. These are French terms widely used in the food service industry. À la carte is used to describe items chosen separately from a menu. Table d'hôte is a multi-course meal ordered as a single menu item. Number 6 has been "programmed" to prefer flapjacks for breakfast as Number 12. Notice that Number 2 has anticipated his choice before he even arrived for the meeting, just as an earlier Number 2 did in "Arrival". This may possibly suggest that, rather than anticipating Number 6's choice in "Arrival", he had also been "programmed" ahead of time to request those items in order to give the impression of near-infallibility by the powers-that-be. Number 2 claims that "Number 12" had the nickname Flapjack Charlie for his love of flapjacks. Does the "Charlie" come from the imposter's real name? He is referred to as Curtis later on, so possibly he is Charlie Curtis? Number 2 mentions a past mission of "Number 12's" in Bucharest. Bucharest is the capital of Romania. At the time the series was made, Romania would have been one of the communist satellite countries of the Soviet Union. The text of the article visible in the February 10th issue of the Tally Ho, which "Number 12" picks up at 12:50 on the DVD, is made up of just scattered phrases from other sources. The two women who perform a makeover on "Number 12" to make him look like Number 6 are Number 249 and Number 269. Two different Number 249s appear in "A Change of Mind" and "Hammer Into Anvil". A different Number 269 appeared in "Checkmate". Number 2 gives "Number 12" the password of Gemini to tell him apart from the "real" Number 6. Gemini is Latin for "twins" and is also the name of one of the twelve constellations of the Zodiac associated with Castor and Pollux from Greek mythology. 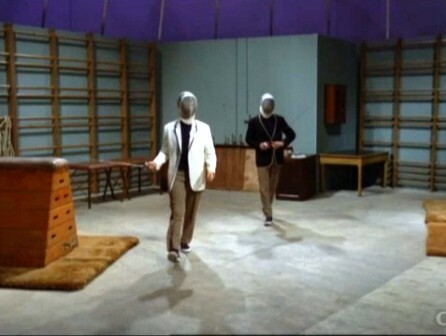 During the scenes in which Patrick McGoohan plays against himself in the same shot, there is usually a faint line visible in the film between the "two" actors. This is due to one half of the film being exposed to shoot the first McGoohan role, then blacking out that half and exposing the other half for the second role, so that the final print makes it appear that two McGoohans are acting with each other. Number 2 does score a victory of a sort by getting Number 6 to proclaim, "I am Number 6." Remember that at the beginning of every episode we hear him say, "I am not a number, I am a free man!" While observing the two Number 6's in the recreation room from the Control Room, Number 2 speaks with Number 106, who seems to be Haitian, about Number 12's mastery at mimicking Number 6. 106 says, "In Haiti we'd say he's stolen his soul." Haiti is a small Caribbean country on the island of Hispaniola. Number 106 seems to be alluding to the Vodou religion practiced by many of its inhabitants. A different Number 106 appears in "A Change of Mind". As the two Number 6s pick up foils for a round of fencing, they toss a few quotes from Hamlet back and forth. Just as they say, the quotes are from Act 5, Scene 2. They are said by Hamlet and Osric in the play, written by William Shakespeare at the turn of the 17th Century. At 19:10 on the DVD, the set of the recreation room appears to have been erected inside the "dome" (Control Room) set. Notice that the dome and struts are visible above and behind the truncated rec room walls! The imposter Number 6 vaguely compliments "Number 12's" fencing skills while at the same time chiding, "...but hardly worthy of my place on the Olympic team." The two also discuss being an Olympic boxer (McGoohan himself was a skilled boxer in college). Does this mean that the real Number 6 participated in the Olympics as both a fencer and a boxer? You'd think it would have been mentioned in "The Chimes of Big Ben", seeing as how the character of Nadia in that episode is said to have participated in the Olympics as a swimmer. The modern Olympic Games (inspired by the ancient Greek Olympics c. 776 BC-393 AD) began in 1896, featuring amateur athletes engaged in numerous sports competitions in representation of their home countries. A poster on the bulletin board outside the rec hall states that a concert of folk music will be held on August 15. That's quite some time away to be announcing a simple folk music concert in a confined environ like the Village considering it's supposed to be February in the current episode. During an impromptu boxing match outside the rec hall, the fake Number 6 says to the real one, "Make up your mind. Are you orthodox or a southpaw?" An orthodox (right-handed) boxer leads with the left foot and fist, while a southpaw (left-handed) does the opposite. The men who hold the fake Number 6 during his "interrogation" are Number 256 and Number 106. Later in the episode, an entirely different Number 256 is seen...a female nurse! And, once again in "The General", two different Number 256s are seen in one episode! Is there something about badge 256 that it never stays with the same person for any length of time? A single instance of yet another 256 appears in "Hammer Into Anvil". 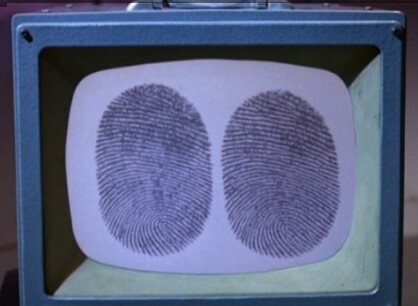 When the imposter Number 6 has his thumbprint scanned in Number 2's office, the image that comes up on the large screen does not quite match the one on file. Yet, when it appears on the smaller screen observed by Number 2 and "Number 12" they match exactly! When "Number 12" calls Number 24 at 25:26 on the DVD, we learn that her name is Allison. At 30:39 on the DVD, the exterior intro shot of the scene is erroneously of Number 6's apartment. It should have been "Number 12's" apartment. If you freeze frame at about 41:07 on the DVD, as "Number 12" is thrown against the breakfast counter in the kitchen, you can see in the background that what would seemingly be a wastebasket (only partially visible) is labeled like the ballot boxes seen previously in "Free for All"! Perhaps this was Number 6's way of stating the value of the ballot box in the Village, especially after his experience in "Free for All"? 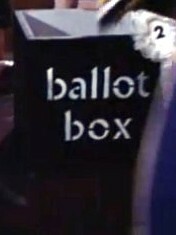 Number 6's wastebasket Ballot box from "Free for All"
At 41:48 on the DVD, the breakfast counter is seen to basically be just a board laid over the mini-refrigerator and a portion of cabinet against the wall when the two Number 6's bump into it on their way out of the apartment. This is the only episode that mentions Rover by name (both Number 6 and Number 2 say it). In scripts and the early novels, Rover was referred to as the Guardian. Obviously, "Rover" is a much cooler name. Allison is seen to have a copy of the book The Mind Reader in her apartment. A few books by that name have been published in the real world, but the author's name here is not shown and the cover does not match any existing publication I've been able to find. Number 2 mentions the General in this episode. Number 6, pretending to be Number 12 makes the mistake of saying he'll be reporting to the General, which makes Number 2 a bit suspicious. You see, at this time, Number 6 did not know that the General is actually a computer that makes recommendations about the Village and its inhabitants (which we learn later in "The General"). To take "Number 12" out of the Village, a different helicopter than usual is used in this episode. It's registration number is FBOEH. A different helicopter is seen in the landing shot though, at 48:43. And the interior shots of Number 6 sitting inside are different as well; notice that green tape is seen on the left-hand window pane behind him and some kind of white patchwork on the right-hand pane. The men who help Number 6 out of the helicopter at the end of the episode are Number 22 and Number 60 (or 66, it's hard to tell). A different Number 22 is one of the exhibition judges in "The Chimes of Big Ben" two different 22s are seen in "Dance of the Dead". A different Number 60 appears in "A Change of Mind". Why does Rover kill the real Number 12? In the past it seems to capture its targets. This seems to be a flaw in the script, as there is no reason for it except that it gets the lookalike-Number 6 permanently out of the way so that the real Number 6 can assume Number 12's identity and attempt to leave the Village. Were the powers-that-be in the Village actually able to duplicate Number 6's fingerprints on Curtis? 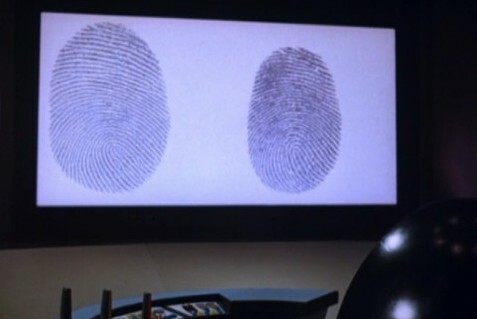 The fingerprint test could have been easily manipulated by the computer. But, if the fingerprints weren't identical, it would be easy for the authorities to identify Curtis' body as not Number 6, ending Number 6's escape plan that much sooner. Or was there a body left to identify? I assume Rover did not somehow dissolve it or something? The impression given is that Rover killed him by asphyxiation.